Reds, oranges, yellows and brown are my favorite colors in the fall. We love watching the leaves change colors in our backyard. Cool weather means summer is over and we’re heading into the fall. We make it a point to plan a camping trip every fall so that we can enjoy the fall foliage in Ontario. The whole family can go bike riding and take long hikes in the forest and watch fall happening all around us. It’s a wonderful opportunity to talk about the science of fall and how leaves turn different colors as they lose the chlorophyll from their leaves. We love watching animals and talk about how the squirrels and chipmunks are getting ready for the long cold winter. 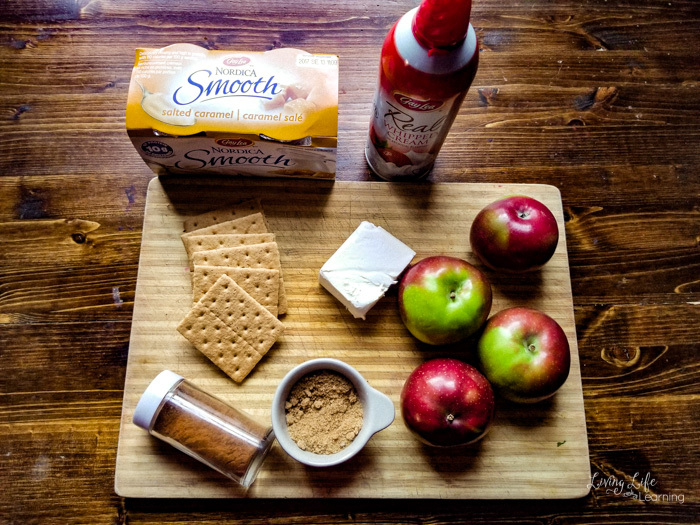 Make the most of fall by using ingredients that are in season. September means apples, apples and more apples for our family. We love the different types of apples with some kids enjoying Macintosh while others prefer Royal Gala. 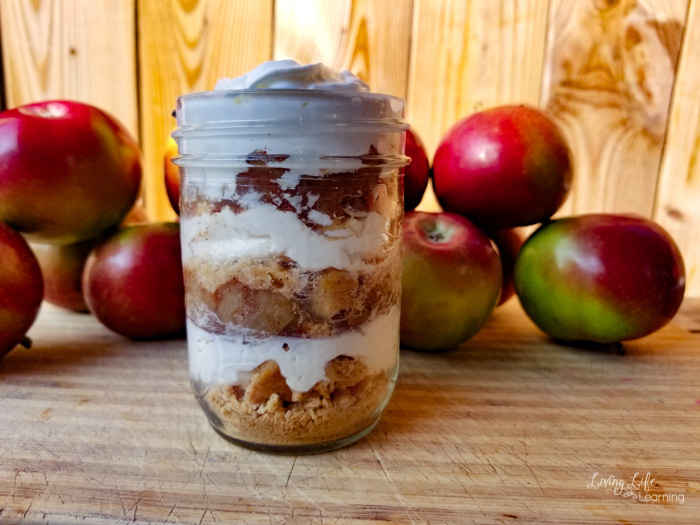 This time I had some Paula red apples on hand and decided to make a wonderful fall treat for the whole family. 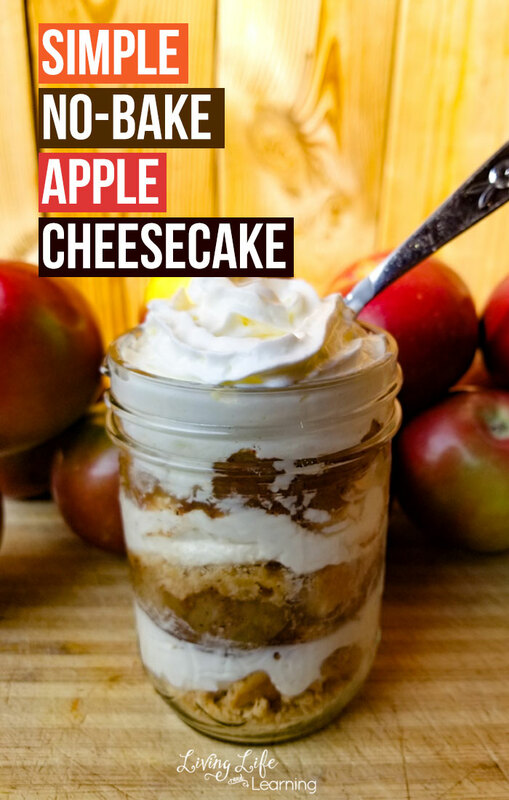 A simple no-bake apple cheesecake recipe that is easy to make and will please the whole family. Place apples, cinnamon, water, and brown sugar into a small saucepan, cover and bring to a boil, cook for 5 minutes and then take off heat and let cool. Mix cream cheese, cottage cheese, and sugar saucepan, until mixed well and smooth. Did you know Gay Lea has Caramel Smooth Cottage Cheese? I wanted to make a cheesecake but really did not have the energy to bake anything this time. Then I saw that they had caramel smooth cottage cheese and thought that may work very well with apples. I love that my food is made of products that are found right here in Ontario and we’re supporting the dairy farmers. 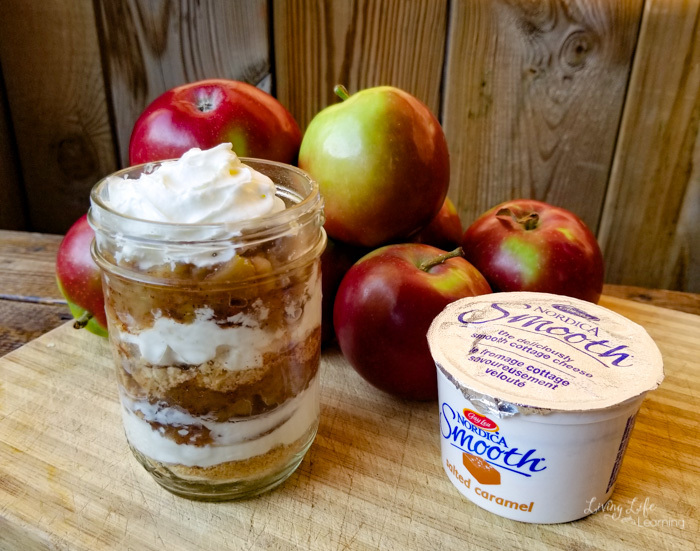 If you go apple picking, you won’t be short of apples for your favorite desserts. I topped this with Gay Lea whipped cream that I had on hand and it was the perfect finish for a mouth-watering treat for the family. My son crushed the Graham crackers for me and he said that if I needed anymore just ask him, he’d be happy to do it. 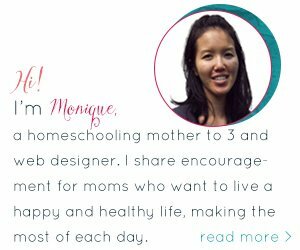 It enjoyed creating something for the kids that was produced with quality food that was bought from my local farms. Knowing that my money supports local farmers is a huge thrill for me.